A group of 41 Macanese youngsters living abroad are gathering in Macau for the third Macanese Community Youth Meeting taking place here between today and next Tuesday. Although almost all were born outside the territory, the members of the young Macanese diaspora said they feel a sense of belonging and an urge to keep their families’ culture alive. Anamaria Judee Puska, who’s joining the event for the first time, has had the chance to visit Hong Kong, where her parents grew up, for the first time too. “I think it’s very important to know who you are but more importantly before you do that you need to know where you came from. It’s very important to me to see where my parents grew up; the culture, the lifestyle, and the things that they talk about and bring that into my family in the States,” she told the Times. Anamaria comes from San Francisco, California, where she’s a member of Lusitano Club USA. Her parents are both Macanese and lived in Hong Kong before emigrating to the United States. “It’s very different from the States, but we took the tram to Victoria Peak and went up to where my parents lived. I felt this overwhelming sense of… I don’t know how to explain it. It felt amazing to see this is where my parents grew up,” she added. 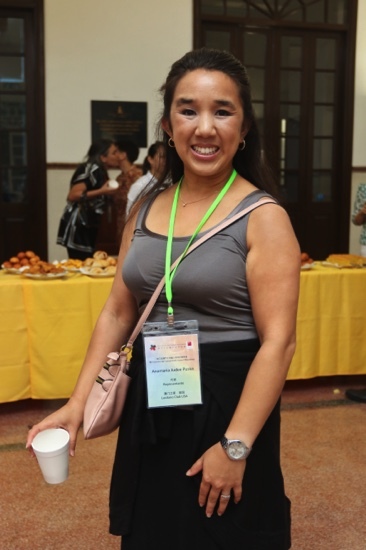 Anamaria is looking to have a better understanding of her culture and the Macanese people by participating in the event, particularly because she feels that it is hard to explain back home what the Macanese culture is all about. Another young Macanese born and raised in America, Miguel Villaram, said that his family’s culture is fairly alive back home thanks to his grandmother’s cooking. “She loves to cook curry and she loves to cook Minchi, just all those traditional dishes. That reminds me of the Macanese culture,” he told reporters at a cocktail reception held yesterday at Costa Nunes kindergarten. Walking through Macau’s streets for the first time, Miguel encountered his mother’s childhood stories. He didn’t fail to notice the city’s development in recent years when compared to the memories of Macau that his mother retains. “My mother has told me about her childhood here and I can see the development and the changes going on there. It’s more fitted to the youth and [the event] will be more fun and interactive,” he concluded. “Not many people know about our culture. It’s part of my heritage so it’s fun to be here and exchange ideas with the other young Macanese. Identity wise… it’s kind of hard, because a lot of people do not know what we are,” he acknowledged. 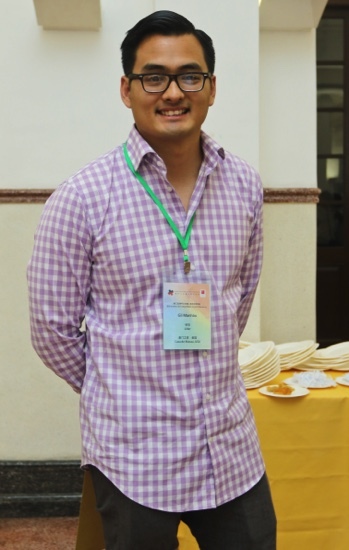 Iana Paes d’Assumpção Vital is one of the youngest Macanese to have been appointed president of a House of Macau (Casa de Macau). She leads the House of Macau in Rio de Janeiro, Brazil. Iana was in Macau last year for another Macanese meeting. Since then, she has taken over the helm of House of Macau in Rio de Janeiro, as she believes that these associations should give young Macanese an opportunity to thrive. “If we don’t start providing young people with the opportunity to lead, the possibility that some of the Houses of Macau might close is high, because most members are already quite old,” she recalled. The third Macanese Community Youth Meeting is organized by the Young Macanese Association and the Council of the Macanese Communities. Most young Macanese participating in the event come from the United States, Portugal, Australia, Brazil and Canada.